‘I have been in a skirmish or two when I was young but never in the line of duty for the good old bank,’ Patrick piped in. ‘As long as she shares her bed with you, it is fine, isn’t it, Luther?’ chuckled Patrick from the front. ‘That is an idea,’ grinned Luther. Soon they were on the outskirts of the city and were about to cross the bridge over the river. Suddenly at a distance, they could see a young woman standing in the middle of the road waving her hands wildly and gesturing frantically to them. As they came closer they could see her clothes were torn and her hair a total mess. It was strictly against regulations to stop the van anywhere except at teller machines. But the sight of Lucy’s frantic face forced Patrick to bring the van to a screeching halt. Fred and Luther got out of the van. Patrick had orders never to leave the driver’s seat. Lucy came limping into Luther’s arms. Her face was bruised all over. She looked like she had been beaten black and blue. ‘Tell us what happened, girl,’ said Luther looking startled. ‘I tried to hitch a ride from Denver yesterday. Remember I had told you I was going there to meet Penny. I missed the bus back to the city and tried to hitch a ride. An elderly man old enough to be my father picked me up. And, and…’ faltered Lucy. ‘The first thing to do is to get to the city, call an ambulance and get you to a hospital. We can’t wait here with this van. Get into the front with Patrick, Lucy,’ said Fred and turned to get back into the van. 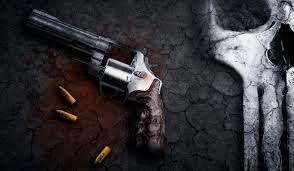 As soon as Fred had his back to him, Luther pulled out his revolver from the holster and shot Fred right through the head. Lucy reached into her torn blouse, pulled out an automatic and fired at Patrick who slumped forward in the driver’s seat. Lucy and Luther threw their bodies into the river. Luther got into the driver’s seat with Lucy by his side, turned the van around and drove away in the opposite direction. Touche! Payback time! Another brilliant story, Jai!